Get immediate feedback on location streaming. Use detailed stream history for troubleshooting. Pull compliance reports over time. See all music and message assignments. 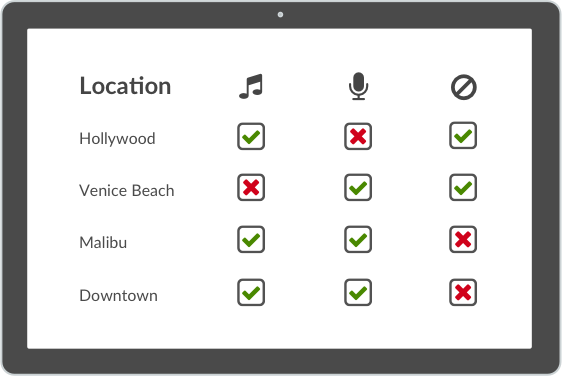 Control your locations with multiple permission levels. 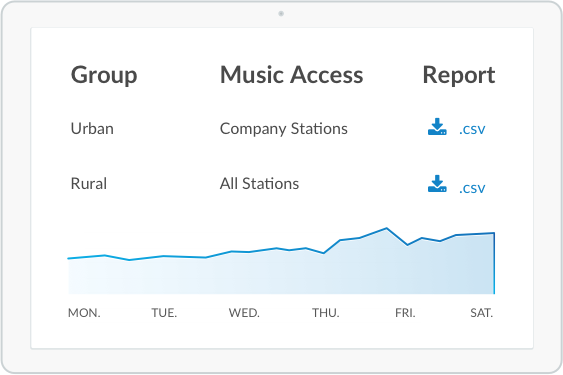 This includes controlling access to a select number of stations chosen to match your brand. Empower managers with remote music control. Change music in one, many, or all locations with one click. Group locations into regions by geography, demography, etc. and target them with specific music selections. Our live support center helps you with installation and troubleshooting. Start with one location and add more as you go. Absolutely no startup cost or location minimum. How much does it cost to have Cloud Cover Music in each of my multiple locations? The cost of having music in multiple locations is determined using a pay-per-stream system. This is due to the fact that Cloud Cover Music must also pay PROs and SoundExchange on a per-stream basis in order to keep everything legal. The Manage plan costs $22.90/mo per location. 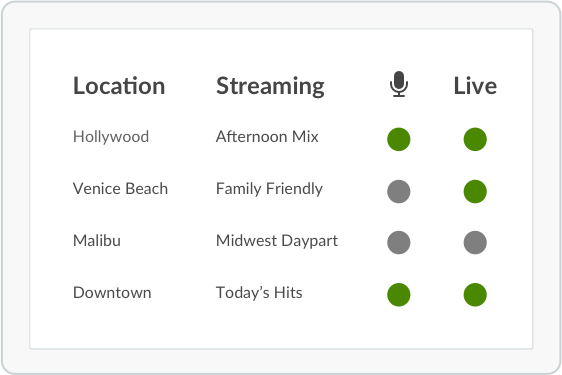 Can I monitor the music in each of my locations to make sure they are streaming properly? With a Manage or Messaging plan, Master Admins can see whether their locations are streaming in real-time through their Locations page. Can I change or control the music selection in all of my locations remotely? Yes, those Cloud Cover Music users who are on the Manage or Messaging plans are able to control every location’s selection from a single Master Admin account. If you are on the Music plan, you can remotely control all of your locations’ music and messages by logging in to each individual account using a computer or compatible mobile device. Can I limit the music played at a certain location? Yes, you can! Simply log in to your Master Admin account (Manage or Messaging plans) and visit the Company Stations page. You can now select specific stations that your locations will be allowed to access. This key feature gives you the power to support your brand with music that is the perfect, unique fit for every single one of your locations. Do each of my locations that use Cloud Cover Music need to have the same hardware? Nope. 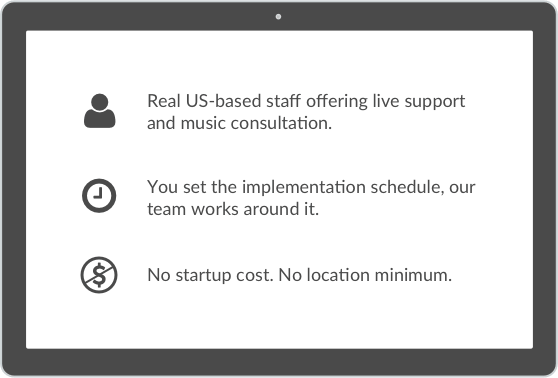 You can use any combination of equipment at any of your locations and still take advantage of the multi-location enterprise solution from Cloud Cover Music. Can I request that each of my locations pay for their own bill? Yes, you can request individual bills for each of your locations if you have 5+ locations in your account. My locations are paying their own bill. Can I still control the music at those locations? Even though some or all of your locations are paying their own bill, you can certainly still control the music that is played in each.